You will be saving some of that hard earned grocery money when you stop buying the dry, tasteless mystery cubes that come in a box. And hey, stop throwing out the end of that baguette you had with last night's spaghetti. Croutons can be browned in a skillet or baked in the oven. Either way, they are wonderfully simple. Use whatever type of leftover bread you have. 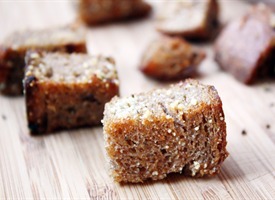 They can be any shape or size from slices of toasted bread, big chunks or small cubes. We generally have wheat sandwich bread with a slice or two, plus the ends in a bag... languishing for days. I make smaller, cubed croutons out of it. If I have a crusty baguette, I make large, rustic chunks. Stored in an airtight container or frozen, they are on hand for many uses. Top a fresh Caesar Salad or toss into a bowl of veggie soup. This is a basic recipe and can be doubled or tripled easily. You can mix it up and use several types of bread. Heat oil in non-stick skillet. Add garlic and toss bread cubes until toasted and browned. Sprinkle with salt, pepper and herbs. 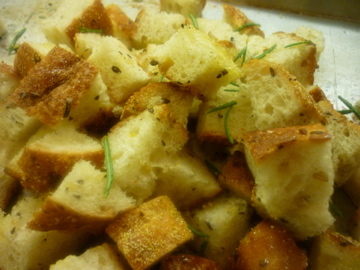 If you would rather bake, toss bread with garlic, salt, pepper and oil. Mix in fresh herbs, if you like, then place on a baking sheet. Bake for ten minutes at 400 degrees, or until crispy and brown. 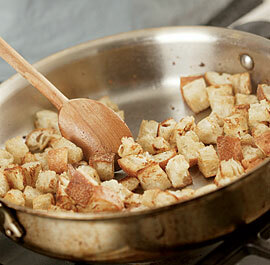 No store bought croutons can compare to homemade ones! Looks fabulous!